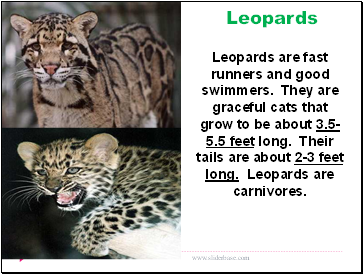 Leopards are fast runners and good swimmers. 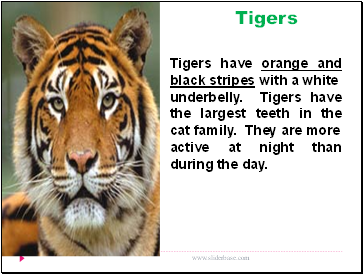 They are graceful cats that grow to be about 3.5-5.5 feet long. Their tails are about 2-3 feet long. Leopards are carnivores. active at night than during the day. black-and-white Chinese bear that is on the verge of extinction. 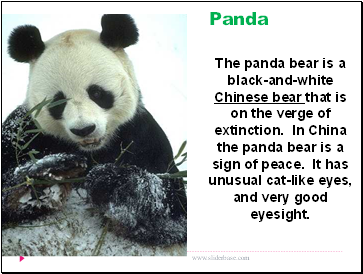 In China the panda bear is a sign of peace. It has unusual cat-like eyes, and very good eyesight. 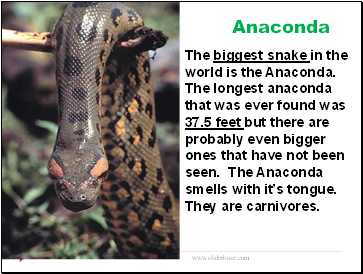 The biggest snake in the world is the Anaconda. The longest anaconda that was ever found was 37.5 feet but there are probably even bigger ones that have not been seen. The Anaconda smells with it’s tongue. They are carnivores. The largest living land animal is the African Elephant. Elephants usually eat roots, grasses, leaves, fruit, and bark. 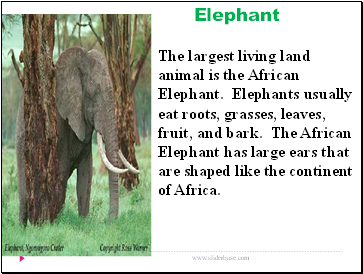 The African Elephant has large ears that are shaped like the continent of Africa.